*Actual On Road Price of Suzuki GSX-S750 at the dealership may vary. We spend a few laps around the Buddh International Circuit astride the newest middleweight performance naked, the Suzuki GSX-S750, and it is impressive! Introducing its first middleweight motorcycle in the country, Suzuki Motorcycle India has launched the GSX-S750 priced at Rs 7.45 lakh (ex-showroom, Delhi). The new Suzuki GSX-S750 arrives about two months after it was first revealed at the Auto Expo 2018 for the Indian market and is the manufacturer's first locally assembled offering in the sub-1000 cc segment, and second CKD model overall, joining the Hayabusa. The new GSX-S750 builds on the sporting DNA of the GSX-R series, taking cues from the Suzuki GSX-S1000 litre-class motorcycle. The Suzuki GSX-S750 is a middleweight naked with a 750 cc engine, but the bike's design and styling is borrowed from its bigger sibling, the Suzuki GSX-S1000. It has a similar looking single headlamp, with a sculpted fuel tank and edgy, sharp, fuel tank extensions and rear end. The GSX-S750 certainly looks muscular, brawny and aggressive, and so in the design department, it ticks all the boxes in the "appearance" department to give it the edgy, aggressive looks of a performance naked. The headlight cowl, belly pan and tail section are all redesigned for a more aggressive look. The headlight still uses a bulb, but the taillight is now LED. Power on the the Suzuki GSX-S750 comes from a 749 cc in-line, four-cylinder, liquid-cooled engine tuned to produce 113 bhp at 10,500 rpm and peak torque of 81 Nm at 9,500 rpm. The bike gets a 6-speed gearbox, while the suspension setup is handled by 41 mm USD Kayaba forks at the front and a seven-step pre-load adjustable monoshock unit rear. Braking duties will be handled by discs at either end of the motorcycle, along with Nissin sourced Anti-Lock Brakes (ABS). 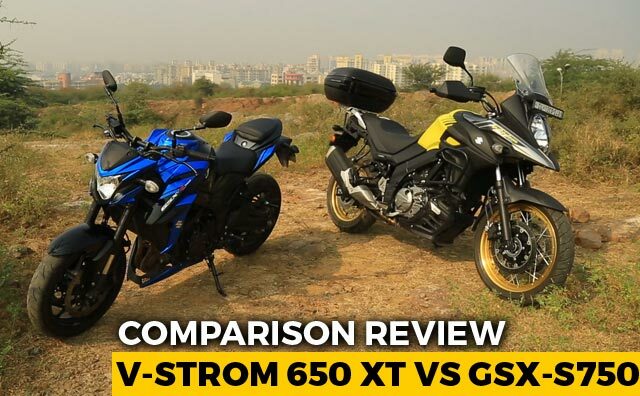 We take a look at how the new Suzuki GSX-S750 and see how it stacks up against its closest competitors, the Kawasaki Z900 and Triumph Street Triple S.